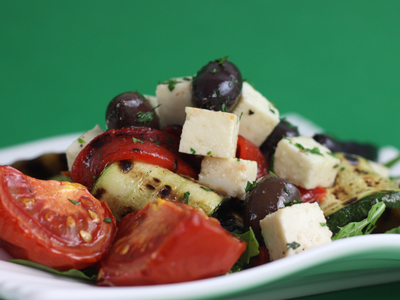 Who said that a vegetarian diet is boring? The Hare Krishna people are well-known as being some of the best vegetarian cooks in Australia. Therefore, it's no wonder that their restaurants are rated amongst the hottest dining destinations for veggie lovers around the country. As any serious vegetarian or vegan will tell you, dining out can be a nightmare, as many chefs are not aware of their specific dietary requirements and even fewer have the skill or experience to prepare a tasty meal that adheres to these guidelines. Hare Krishna restaurants solve this dilemma, providing hungry vegetarians and an ever-growing fan base of omnivores, a delicious and healthy meal at a decent price. A simple but sumptuous garden salad at Hari's Vegetarian Restaurant in Ultimo. The image is from the Hari's Vegetarian Restaurant website. With restaurants in most of Australia's capital cities and several other popular locations, Hare Krishna restaurants are extremely diverse in size, cuisine and ambiance. While the original eateries which popped up in the eighties were generally simple cafeteria-style places serving budget meals to local students, backpackers and yoga practitioners, these days many present a more diverse international menu aimed at a wider clientele. Over the years society has changed dramatically, and while vegetarianism was once considered an extreme lifestyle choice, strictly limited to a small lunatic fringe, these days it enjoys a much wider following due to a greater awareness of health, ethical and environmental considerations. Hare Krishna practitioners follow a lacto vegetarian diet, meaning that they avoid food items made of meat, fish and eggs, while still consuming dairy products. However, many of the foods prepared in their restaurants also adhere to vegan requirements (which totally eschew any animal products), so if you follow a vegan diet, speak to staff members and find out which preparations are free from dairy. Generally, the rice and dal are dairy-free, as well as many of the subjis (vegetable stews), samosas (vegetable pastries) and other savouries. Stuffed parathas at Hari's Vegetarian Restaurant in Ultimo. 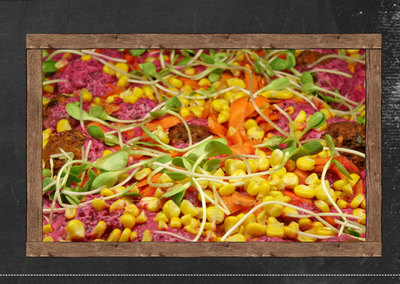 This image is from the Hari's Vegetarian Restaurant website. 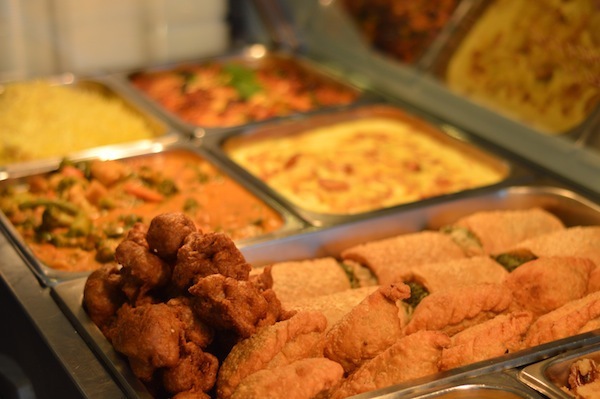 In a nutshell, Hare Krishna restaurants provide delicious and affordable meals which will appeal to not only dedicated vegetarians, but anyone who enjoys great food prepared with a mood of love and joy. While the location, size and decor may vary, each establishment is invariably a tranquil spiritual oasis amidst the noise and frenetic activity of twenty-first century life. With beautiful Indian bhajans (devotional songs) playing in the background, and helpful staff members, the ambiance of a Hare Krishna restaurant is truly unique. Following, is a list of the best Hare Krishna eateries in Australia. Whether you're a vegetarian or not, keep them in mind next time you're in the city or are travelling interstate, and relish the special dining experience which they provide. Australia's largest city is home to three Hare Krishna restaurants. Situated at 112 Darlinghurst Road in Darlinghurst, Govinda's is a funky inner-city restaurant which has been a firm favourite on Sydney's vegetarian and yoga circuit for decades. The restaurant employs some of the best vegetarian chefs in Australia, and this is reflected in its sumptuous international menu. The buffet at Govinda's Restaurant in Darlinghurst. This image is from the Govinda's website. Connected with the restaurant, Govinda's Lotus Room is a tranquil, uplifting spiritual space which holds regular seminars and workshops relating to meditation, yoga, vegetarianism, classical Indian devotional music and other many other topics. If you want to learn how to cook the yummy preparations from the restaurant, regular vegetarian cooking classes are held here. Also popular are the kirtan meditation evenings, consisting of yoga chants, which are held three times a week. For more information about Govinda's and all the cool events that are hosted there, check out this website. Situated at the Sydney Hare Krishna temple in North Sydney, at the corner of Falcon and Miller Streets, Krishna's Vegetarian Restaurant is a small but dynamic eatery which serves a classic assortment of pure vegetarian meals and is open every evening from 5.30 until 8.30pm. Opening in early April, 2013, Hari's Vegetarian Restaurant will serve all the usual Hare Krishna favourites including wholesome rice and dahl, sumptuous vegetable stews and to-die-for sweets, as well as a good selection of tasty affordable meals for vegans and people following gluten free or raw diets. It will also offer a first-class catering service, with a diverse, mouth-watering selection of preparations for every kind of function, from office meetings to large corporate events. The Quinua and Vegie Bake at Hari's Vegetarian Restaurant in Ultimo. This image is from the Hari's Vegetarian Restaurant website. Hari's Vegetarian Restaurant is situated at 157 Broadway in Ultimo. For more information, check out their website or give them a call on 02 9212 1010. Vegan Bruschetta at Hari's Vegetarian Restaurant in Ultimo. 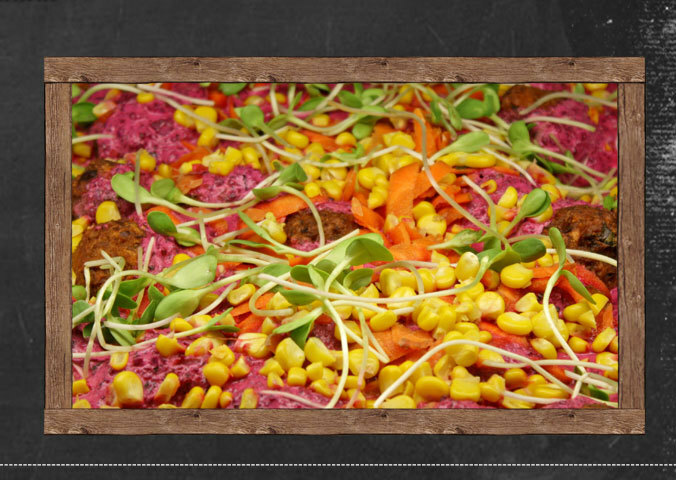 This image is from the Hari's Vegetarian Restaurant website. For the last thirty years, Crossways vegetarian cafeteria has been a local icon for vegetarians living in Melbourne. Serving hearty and affordable fare, it's popular with students, travellers, pensioners and local vegetarians, many who come here on a daily basis. Crossways serves a standard Hare Krishna buffet of rice, dal, vegetable stew, pappadams and halava, all for an unbelievably cheap price. It's situated on Level 1, 123 Swanston Street in the city, and is open Monday to Saturday, from 11.30am until 3.30pm. For those who may be interested, yoga classes and other spiritual workshops are also held here on a regular basis. Gopals Restaurant in Melbourne. This image is from the Australian Hare Krishna centres website. More upmarket, Gopal's Pure Vegetarian Restaurant at 139 Swanston Street is another Hare Krishna dining destination which has gathered a huge number of fans over the years. The menu here is international, and diners can select from a wide range of savoury and sweet preparations, some of which are also vegan. For more information, including opening hours, call 03 9650 1578. Brisbane has not one, but three, fabulous Hare Krishna Govinda's restaurants. The best-known of these is situated in the heart of the city on the first floor, 99 Elizabeth Street, and has been a Brisbane icon for several decades, serving a devoted clientele of local office-workers, students, pensioners and families. It's a large place with plenty of seating and serves a wholesome range of vegetarian and vegan favourites seven days a week. 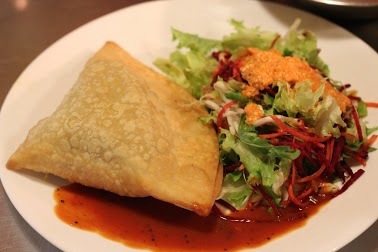 Yummy samosas are just some of the delicacies which can be found at Govinda's Restaurant in Brisbane. This image is from the Brisbane Govindas website. The other two eateries are situated at West End and Stone's Corner. For more information about all of these establishments, including opening hours, go to the Govinda's Restaurant website. Far north-eastern New South Wales and Southern Queensland are a magnet for those desiring to follow a wholistic lifestyle and meat-free diet. It's therefore no wonder that there are four Hare Krishna restaurants in this divinely beautiful part of the country. Situated in beautiful Burleigh Heads, just one block away from the beach, Govinda's Restaurant is a small but popular eatery with a young funky vibe and great food. Serving a contemporary international selection of vegetarian and vegan dishes it's developed a huge following with both locals and the many holiday makers who frequent the area, and whenever I've popped in, it's been very busy. Specialties include scrumptuous vegetarian lasagne, cottage pie and Potato Gauranga, a yummy caserole prepared with layers of potatoes and lots of sour cream. There is also a good selection of popular Indian preparations like rice and dahl, a fabulous salad bar and heavenly sweets. As this restaurant is quite small, it can get very crowded at times. Therefore, if the weather is favourable, I'd recommend getting a takeaway and heading down to one of the picnic tables by the beach. For more information, have a look at the Govinda's Restaurant website. 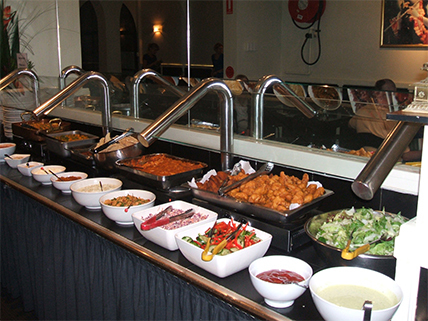 The buffet at Burleigh Head's Govindas Restaurant. This image is from the Burleigh Heads Govinda's website. Nearby in Broadbeach, the Cardamom Pod is a beautifully presented, privately-owned Krishna restaurant which specialises in a wide variety of gourmet meat-free preparations, many of which are made from organic ingredients. As well as all the usual yummy Hare Krishna preps, this place also offers a comprehensive range of meal choices for vegans and those with special dietary requirements (gluten free, sugar free, etc). The Cardamom Pod is situated at 11 / 110 Surf Parade, Broadbeach. For more information, go to the Cardamom Pod website or call 0452 218 108. The Cardamom Pod serves a variety of wholesome salads. This image is from the Cardamom Pod website. Further up the coast, Govinda's Veg-O-Rama, is another classic Hare Krishna eatery. Situated in Shop 134 at the Centro Shopping Centre on Cavill Avenue, it's the perfect place to get kids to eat their vegies. It offers several tables for diners, but if those are full, get a takeaway and enjoy it at the nearby beach. This place has really friendly staff and the food is awesome, much of it being vegan, including a yummy tofu noodle stir fry and dairy-free cheesecake. Of course, there is also a comprehensive assortment of the old Hare Krishna favourites including samosas, pakoras, kofta balls and great vegie curries. The Giri Kana Cafe at 82 Marine Parade in Southport is another Hare Krishna dining destination which presents a wide range of unique gourmet vegetarian and vegan delicacies. It's popular not only with those who follow a meat-free diet, but many who simply appreciate great food made with love and good spiritual vibes. In addition to an amazing main menu which is served at lunch and dinner, it also provides an awesome range of breakfast preparations guaranteed to kick-start your day in a healthy way. There's a good juice bar as well and the range of sweets has to be seen to be believed. Check out their website to learn more, or call them on 07 5591 3555. Located in magnificent Maroochydore, Gopal's Pure Vegetarian Cafe is a fabulous little spot with a wide selection of affordable vegetarian and vegan eating options. As well as the standard but sumptuous Hare Krishna fare, the cafe has a great salad bar, lots of yummy sweets and I've heard many very good reports about their vegetarian lasagne. 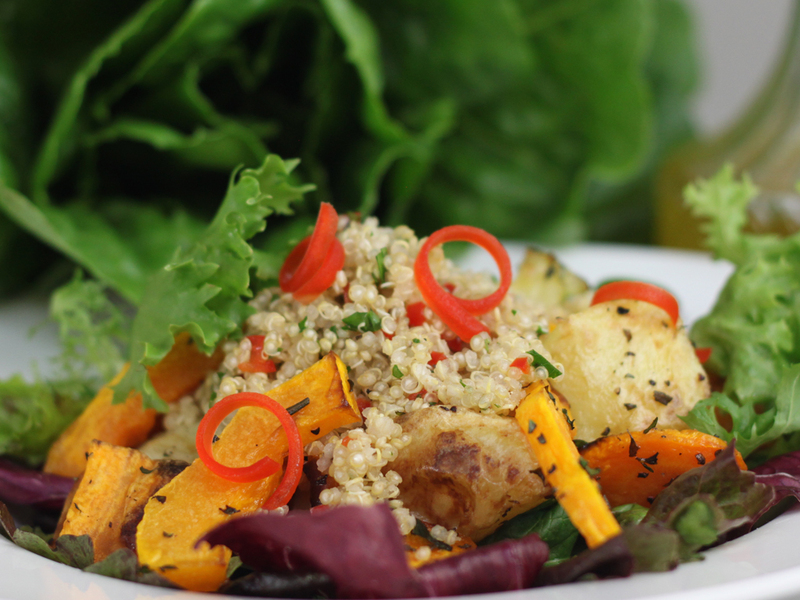 The cafe also does catering, so if you want to treat your guests to a delicious and wholesome vegetarian feast for your next celebration, this is the place to come. 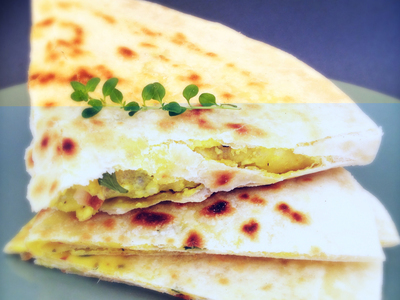 Gopal's Vegetarian Cafe is situated at 2 / 7 First Avenue, Maroochydore. To find out more, call them on 07 5479 4004. 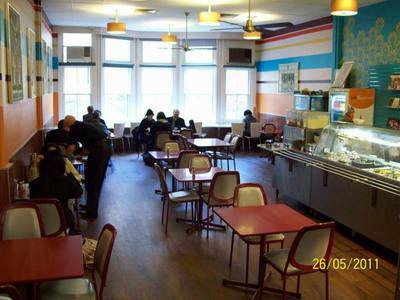 Adelaide also has a Govinda's Restaurant, which is situated on the ground floor of the Hare Krishna Temple at 25 Le Hunte Street in Kilburn. It serves a wonderful selection of delicious vegetarian fare in an attractive setting, as well as takeaways. The restaurant can also provide catering, including yummy cakes which are baked without the use of eggs. For more information about the restaurant's current opening times and any other enquiries, call 08 8359 5120. Perth's Govinda's Restaurant is situated at 194 William Street in Northbridge, just a short walk from the city's CBD and cultural precincts. It has been operating in the city for approximately 25 years and is now something of a local icon, with a big following amongst local office workers, students from the nearby TAFE college and young international backpackers. The restaurant serves a delicious buffet of mainly vegan fare, with the main dishes changing on a regular basis. It's open from Monday to Friday, from 11.30 am until around 7.00pm, and sometimes later. To confirm opening times and any other details, give them a call on 08 9227 1684. Why? 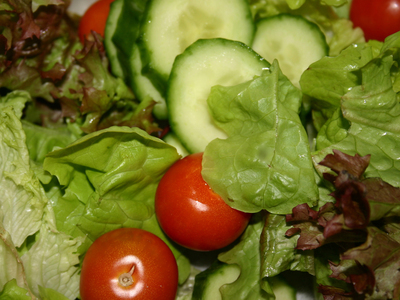 At Hare Krishna restaurants you learn how delicious and healthy a meat-free diet can be. When: The opening hours of these eateries varies. Where: At different locations around Australia. Great article. I would suggest that vegetarian is actually more interesting with more greater depth of colours and flavours, as well as rich cultures incorporated. Additionally, it can be healthier if you have whole foods and fresh vegetables + you are not ingesting the fear and sadness of the animals - so better for your spirit. Interesting! I'm a vegetarian and do sometimes find it difficult when there's a choice between potato wedges or potato chips at a restaurant and all the rest contains meat! I guess it's just my style of writing. Other words could have been used, but the word seemed to be most suitable for the message I was trying to convey. I chose it since the preparation of the foods is very important in Hare Krishna cooking...they emphasise that it should be done in a spiritual consciousness, not just slapped up quickly and mindlessly. Therefore, although I thought about using the words you suggested ( and others), they didn't seem quite appropriate for the context. Just wanted to add that there is also the awesome Hare Krishna restaurant in Byron Bay. Also called the cardamon pod, open 7 days a week all day for lunch and dinner, this small cafe size restaurant has all the Krishna favourites, like rice, Dahl, subjees, curries, veggie bakes, pasteries,yummy salads and amazing deserts. Find it in the first arcade just past the roundabout in the centre of town, one block from the beach. Enjoy! Hare Krishna! Is there something about Hare Krishna food that relates to the word "preparations"? I counted it 7 times in this article. It seems a very specific word to use instead of "meals", "foods", "plates", "options" or "dishes".